Maintaining one’s body weight and having a healthy positive lifestyle requires a lot of effort. But phone applications, like Android developers are constantly developing a number of applications that are designed to boost the fitness and health plans of such individuals. There are countless applications on the go, but here are some of them. These applications are very effective in having a lasting and satisfying effect. Some of the latest android apps for weight loss are mentioned here. 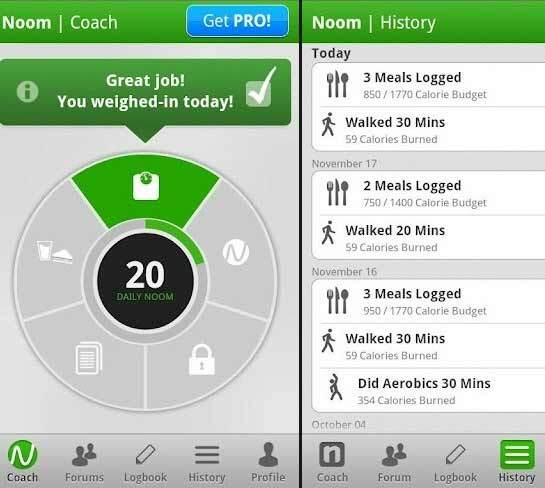 Noom is a very intelligent weight loss app offered by android. Till date, it has successfully helped around six million individuals in their weight loss program. The coach in the app blends artificial intelligence along with the knowledge of weight loss experts and top nutrition researchers. The app has a daily task menu where daily tasks for you will be provided which will you bring about positive changes in your lifestyle and thus bring about weight loss in the long term. The coach also monitors your capacity to complete these tasks and adjusts them according to you. It also motivates you be delivering encouraging messages along with a daily Noom score, sometimes reminders are also sent and the tracking system is convenient as well as simple. This app is one of the best apps for weight loss offered by android. It helps in losing, gaining, maintaining weight and having appositive lifestyle. It offers healthy diet plans, progress charts, advanced weight tracker, and all this in just one application. Some of its features are providing healthy choices to mix the diet food in the right combination, personalized diet plans, personal dietician, nutrition facts, weight loss manager, BMI calculator, weight chart, weight loss tricks and tips etc. the users are highly satisfied with the applications and new ones are joining in daily. This application is free in the android market and is a simple one for individuals interested in tracking their calories intake. It provides with the recommended daily intake for the user so that one can achieve the desired weight and stay fit. It also has a built- in barcode in order to make the finding foods in a snap form. The major factor which contributes to weight gain is the amount of calories consumed. People today are so busy with their work that they do not have time to measure what they are taking in. They really are burning out the extra calories. This LoseIt application is the best for such individuals as it calculates the amount of calories that the foodstuffs taken in by the user contain. It also guides the user by guiding on the amount of exercise that will be required to lose the calories consumed. With your present weight, age and goal weight it will also tell you the amount of calories you must take in to reach the desired weight. It is one of the best applications for those calorie conscious individuals. James is a fitness lover and he loves to blog on diet plans, tips and exercises that help you know how to lose belly fat effectively. You can visit his blog here.